ALMOST three months after Michel Martelly took office as president, Haiti’s political affairs are still in limbo. The country’s parliament this week again refused to accept his nominee for prime minister, a prerequisite for a new government to be sworn in. Acting ministers, held over from the previous government, have not been to a cabinet meeting in three months, and are able to handle only day-to-day payments. Haiti, the poorest country in the Americas, can ill afford this gridlock: decisions are needed to speed recovery from the devastating earthquake of January 2010, the hurricane season is entering its peak and children are due to go back to school next month. International officials responsible for the $10.2 billion in aid pledged after the earthquake are wringing their hands. Haiti has been down this road before, with disastrous results. It went without a prime minister from June 1997 to March 1999. René Préval, the president then (and again from 2006 until this year) dissolved parliament in January 1999 and ruled by decree until elections the next year. Donors froze aid. This time the root of the deadlock lies in part in the flawed general election of last November, which featured chaos and widespread claims of fraud; only 1.1m of a potential electorate of 4.7m managed to cast their votes. 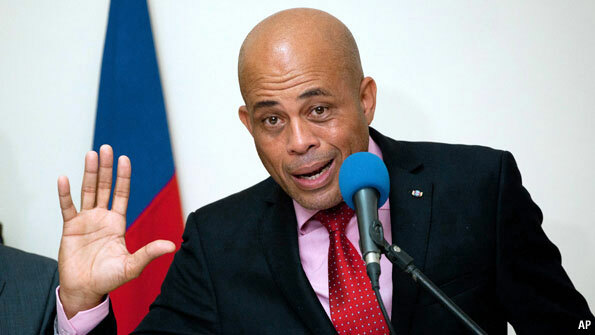 Mr Martelly only got on to the ballot for a presidential run-off, held in March, after the Organisation of American States and other outsiders stepped in and forced a recount in which he was found to have more votes than Mr Préval’s candidate. He won 68% in the run-off (but only 23% of the electorate voted). Mr Martelly is a political novice. He was once known to Haitians merely as “Sweet Micky”, a popular singer with a reputation for bawdy stage antics. His foes point to his past ties to some unsavoury figures such as Michel François, a much-feared police chief accused of drug trafficking who was a key figure in a military coup in 1991 that overthrew Jean-Bertrand Aristide, a left-wing president. Mr Martelly’s supporters say that in those days such links were the price for being allowed to perform. He was elected on a promise to break with the political instability and corruption that has dogged the country since the end of the Duvalier dictatorship in 1986. But in the parliament it is Mr Préval’s allies who dominate. Mr Martelly has not shown himself to be a builder of consensus—a necessity given his lack of support in the legislature. “He doesn’t understand cohabitation and he should realise that we were elected, too,” says Simon Desras, a senator. Mr Martelly’s first choice for prime minister was a successful businessman and fervent Catholic. When he was rejected the president proposed Bernard Gousse, a former justice minister who used the job to persecute political opponents, including some current legislators. Mr Gousse was rejected by the Senate this week. Perhaps because of his experience as a stage performer, Mr Martelly has hitherto gone down well with ordinary Haitians. But he faced his first protest in late July: he was pelted with plastic bottles and stones on a visit to Cap Haïtien, the country’s second city. He reacted by ordering an investigation into what he claimed was a plot to kill him. His friends say that while he is hard-working and a good listener, he is still adjusting to the demands of governing. “Sweet Micky should let Michel Martelly be the president,” says one of them. Many worry that the vacuum could prompt unrest after four years of relative calm. UN peacekeepers have mounted raids in some of the rougher slums in Port-au-Prince, the capital, to keep criminal gangs in check. Another fear is donor fatigue. Only about a third of the $5.6 billion pledged at a donors’ conference more than a year ago has been disbursed. About 600,000 earthquake victims are still living in tent camps. Mounds of rubble have yet to be removed from the capital’s streets. “The amount of debris still littering the streets could fill 8,000 Olympic-sized swimming pools,” the UN Development Programme reported recently. Some of those still in the tent cities see them as a better option than renting. And a lot of rubble has been cleared. By laying waste to much of the capital, the quake exacerbated Haiti’s pre-existing weakness of government capacity and infrastructure, points out Josef Leitmann, who manages the World Bank’s Haiti Reconstruction Fund. So Haiti has also fallen victim to exaggerated expectations Mr Martelly is working on a plan to shift the residents of six of the camps to new housing. But he will need to move fast. The patience of Haitians is not infinite, and neither is that of Haiti’s financial backers. Copyright © The Economist Newspaper Limited 2011.